A detailed medical history is necessary to decide if orthotics are the most appropriate treatment to help you. Knowing how and when your complaint started can help build up a picture of your problem. It is important to test your muscles and joints for normal and abnormal movement. Do you pronate (rotate your foot in) or supinate (rotate your foot out)? Do you have flat feet, bunions, hammer toes? Do you have heel pain, plantar fasciitis? Do you walk with a bouncy gait or a very heavy gait? Do you in-toe or out-toe when you walk? Do you have pain anywhere else in your body - knees, hips, lower back? It is important to get a complete picture of how the feet function in a weight bearing and moving situation. By walking and standing on a pressure mat on the floor, various sensors in the mat can locate areas of imbalance and determine poor foot function. The information gathered by the sensors is analysed by the computer software and an individual graph analysis report is produced. The information from the medical history, the biomechanical assessment, and the computerised gait analysis is then sent to the lab for further analysis by technicians using computer aided programs to assess exactly the orthotic necessary. It is important to use a high quality lab to produce the orthotics to ensure an accurate, long lasting and comfortable orthotic. The orthotics will be ready for fitting after about 2-3 weeks. Orthotics need to be carefully worn at first as they fundamentally change the way you walk. They should be worn for about 1-2 hours the first day and 2-3 hours on the second day and so on. By the end of 1-2 weeks you should be wearing them all day. Some people adjust more quickly than others. Mild discomfort, particularly in the hip area, can occur at first if the break-in period is too short. Once your body has adjusted to a new walking position these aches, if present, should quickly disappear. Keep orthotics away from animals. Dogs tend to find orthotics quite attractive to chew. Heel slippage with some shoes: try other shoes and try to purchase shoes with a deeper heel seat. Slippage can reduce or disappear as foot function improves. Orthotics for running: to help control excessive pronation. 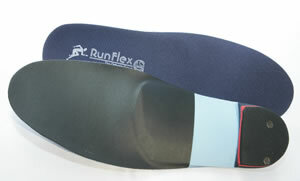 Custom made orthotics for road running, cross country running, jogging and treadmill running. Biomechanical examination and computerised gait analysis is available to determine your problem and the type of orthotic you need. Superflex custom made orthotics for everyday use. Skiflex custom made orthotics for skiboots.